Ocean Bay Club 1205 is the perfect vacation rental for your family vacation, SOS event, golf group, or winter residence. Enjoy the Ocean Drive Difference by starting your vacation immediately upon arrival, as this property comes with fresh bed linens/bath towels, the beds are already made up for you, and the departure maid service are all included in your price. This beautiful 4 bedroom condo offers breathtaking views of the beach and ocean, complete with large oceanfront balcony, second side balcony, and ocean views from three of the four bedrooms.This property has been furnished for your convenience and relaxation with comfortable furniture, washer and dryer, and fully equipped kitchen with everything you need to prepare meals. The private master bath features a big garden tub and separate shower. Keep up with your workouts in Ocean Bay Club's full size fitness center facing the ocean. Children and adults alike will love the pools, hot tubs, and lazy river at this resort! 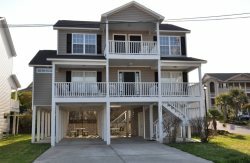 Ocean Bay Club is in close proximity to popular North Myrtle Beach attractions, shopping, and restaurants. Ocean Drive's famous shag clubs are just a short walk away from the resort. Guests have access to refreshing pools, lazy river, hot tubs, and a kiddie pool.